Anonymous online chat therapy groups for people with bulimia nervosa prove just as effective as face-to-face meetings — a treatment form that could save both cost and lives. UNC researcher Stephanie Zerwas explains. Many people with eating disorders don't have easy access to the specialists who can help treat them. Online group chat therapy could be a viable alternative that influences more people to seek treatment. In 1995, less than 1 percent of the world population had access to the Internet. Today, approximately 40 percent of people can get online — that’s 3.5 billion users. During this time, online chatrooms have slowly evolved, from MUD gaming servers in the late ’70s, to the AOL Instant Messenger days of the ’90s, to the social networks of today. Now, nearly every platform has its own chat function. Most of us can relate to the bittersweet beauty of constantly logging on — the negative commentary, little to no censoring, and the struggle of online addiction. But for those of us dealing with more serious compulsions — such as drug and alcohol abuse, depression, and eating disorders — the Internet becomes, to many, a hub for disclosure. Reddit, for example, has a series of sub-forums where drug users anonymously discuss everything from colorful anecdotes to advice for recovery. About 10 years ago, Cynthia Bulik — the founding director of UNC’s Center of Excellence for Eating Disorders — was quick to recognize the benefits of this technology. In 2008, she appointed Stephanie Zerwas, an eating disorders researcher and clinician, to coordinate the project. Zerwas teamed up with researchers from UNC’s psychiatry, biostatistics, neurosurgery, and nutrition departments to study the outcomes of online chat therapy on people with bulimia nervosa. This serious, potentially life-threatening eating disorder is characterized by purging after overeating. Intrigued by the growth of online chat groups, Bulik, Zerwas, and their team incorporated the social mechanism into the 2008 study. They solicited a group of 196 adult patients with bulimia, who were randomly divided into two segments — one attended weekly face-to-face group therapy sessions, while the other received therapy within an online chat group. Both parties received up to 16 therapy sessions over the course of 20 weeks. At the end of treatment, it was obvious that the face-to-face group produced better results. But by the one-year follow-up appointment, the gap in treatment had narrowed. Online participants were at the same level of recovery as those who participated in the face-to-face therapy sessions. 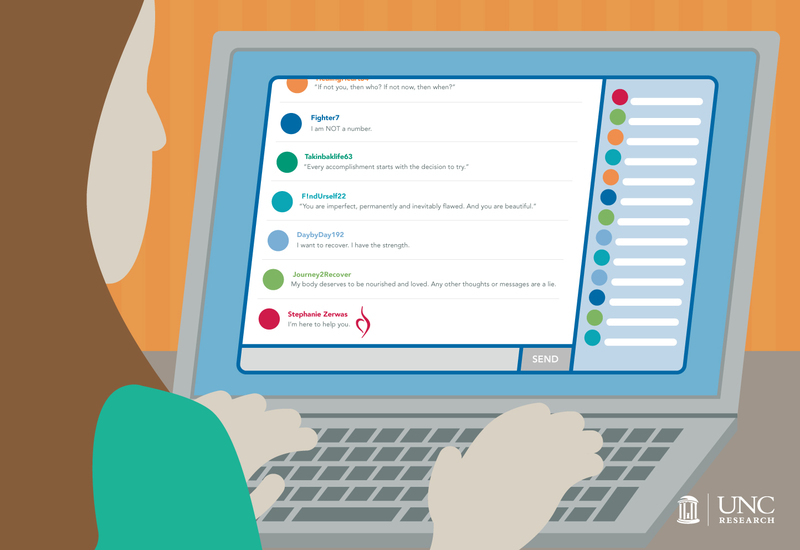 Online group chat therapy provides a level of anonymity that comforts many people with bulimia, who often struggle with feelings of inadequacy and social anxiety. One of the most common emotions associated with eating disorders is shame — which often leads to the act of binging and purging associated with bulimia. In fact, humiliation (a type of shame) produces a more intense emotional experience in the body and brain than happiness or anger, according to a 2014 study from the University of Amsterdam. These feelings of inadequacy most likely stem from social anxiety, which is why group therapy — a more affordable option to one-on-one cognitive behavioral therapy — can be an intimidating feat for someone with bulimia. “I’ve had patients who struggle with social anxiety so much that they’re even nervous about traveling on public transportation to get to their appointments,” Zerwas shares. 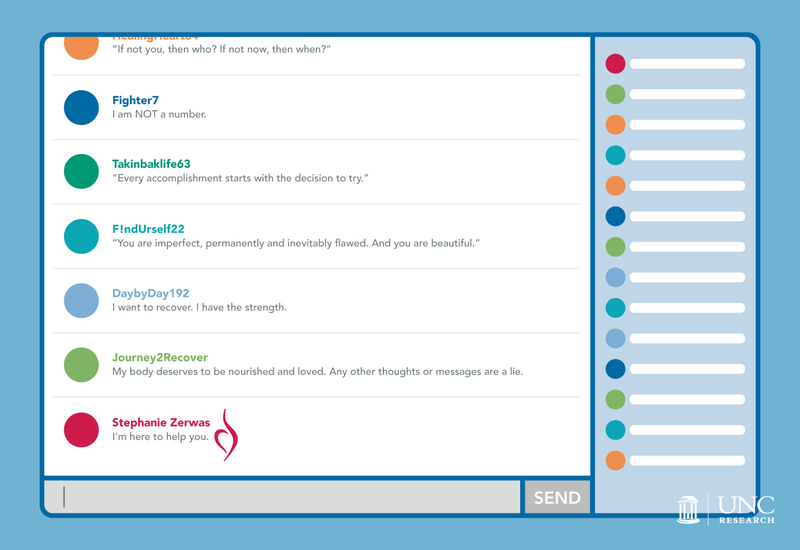 Since she began studying online chat therapy, Zerwas quickly grew interested in other social platforms. In 2015, she and Morgan Walker, a research assistant with the Center in Excellence for Eating Disorders, researched online body and weight dissatisfaction. It’s especially prevalent among college students, 20 percent of whom obsess about what they eat and how they look, according to Zerwas. Here’s what she and her team wanted to know: Does this era of online social media make us more obsessed with our body, shape, size, and weight than ever before? Zerwas and Walker gleaned three observations from their Facebook research. The first: Share don’t compare. Online body comparison is so common, according to Zerwas, that a series of hashtags promote it (i.e. #bodygoals, #bikinibridge, #thinspiration). “It’s a predictor for hating how you look and starting a really risky diet,” she says. At the end of her talk, Zerwas reminds the audience to “choose radical media.” In other words: Stop consuming the same, negative content over and over again. “In social media, you are the media — and you have more control over what you look at than ever before,” she says. “Often, we don’t use social media to find new ways to interact with each other. We just use it to reinforce and duplicate our existing toxic media structure — a structure that’s overly appearance-focused.” Her point? We choose who we follow on Instagram, what we pin on Pinterest, and, most importantly, what we post about ourselves. So it’s up to us to create meaningful change. Although there were many benefits to the online group therapy, it didn’t come without problems. The safe space created by anonymity becomes problematic during times of crises, when a therapist needs to reach out to a patient beyond the fourth wall of the Internet. The integrity of the group may also be compromised by the possibility of negative comments or without a strong therapist to moderate the discussion. “We’ve all seen people write horrible things in forums or comment sections and get away with it,” Zerwas says. Then come the difficulties of crossing state lines. Physicians, typically, are licensed only for the state they work in, so care ceases if their client moves out of state. The same holds true for online therapy. Before the study began, Zerwas received many requests from interested participants who lived out of state, but she wasn’t able to include them in the study because of licensing laws. Internet security creates another hurdle — how can physicians guarantee their patients’ private disclosures remain safe? Any release of confidential patient files could be incredibly damaging for people with eating disorders, especially since they already suffer from feelings of shame and anxiety. “Whatever system gets used has to be really fool-proof and requires a lot of security,” Zerwas stresses. Zerwas began this study one year after the release of the original iPhone. Since then, technology has morphed at an exponential rate. “I kept joking that, by the time this study got published, we’d be using holograms,” Zerwas chuckles. She’s not far off. The Virtual Reality Medical Center in California, for example, uses virtual reality exposure therapy to treat panic and anxiety disorders such as fear of flying, claustrophobia, and posttraumatic stress disorder. For people with eating disorders, specifically, an app called Recovery Record helps them create and record meal plans, develop coping skills, and collaborate with their treatment team. Although Zerwas hasn’t decided if she will pursue another study using online tools, her efforts still remain full force with eating disorder treatment and prevention. As the newly appointed clinical director of UNC’s Center of Excellence for Eating Disorders in January 2016, she wears two hats. In her research, she’s focused on the genetic link between anorexia nervosa and obsessive compulsive disorder (OCD), but in her clinical work, she is trying to improve early detection and intervention for eating disorders in North Carolina. Stephanie Zerwas is the clinical director of the UNC Center of Excellence for Eating Disorders, as well as an associate professor of psychiatry in the UNC School of Medicine. Cynthia Bulik is the founding director of the UNC Center of Excellence for Eating Disorders, the associate director of the Center of Genomics, the Distinguished Professor of Eating Disorders in the UNC School of Medicine, and a nutrition professor in the UNC Gillings School of Global Public Health.